By focusing simultaneously on housing, language acquisition, training and work, public authorities will minimise the amount of valuable time lost in integrating asylum migrants. In 2015, the public debate was dominated by moving images of migrants making their way to Europe and by the concerned reactions of European citizens to the asylum issue. Attention is currently focused mainly on the problems relating to the local reception of new groups of asylum seekers. 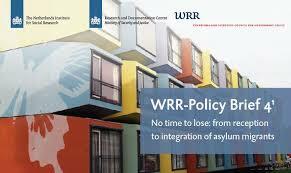 At the same time, however, policymakers face a second fundamental challenge, which is the question of how to facilitate the integration of asylum seekers who have been granted a residence permit into Dutch society. The need for an accurate and rapid asylum procedure in which greater attention is devoted to the labour potential of permit holders and their opportunities in the labour market in the Netherlands. The need for an approach in which language acquisition, schooling, securing housing and finding work occur simultaneously rather than sequentially. With such an approach, permit holders will be able to support themselves and make a contribution to the receiving society sooner, which will in turn fortify public support for the asylum policy.